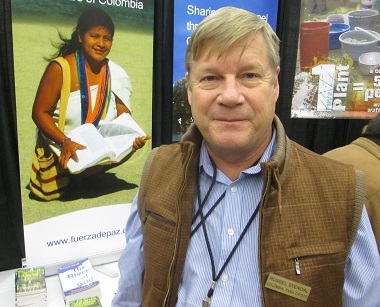 Russ Stendal comes to Missions Fest every year from his home in Colombia. A regular Missions Fest speaker received an international award for his peace-making efforts in Colombia just days before arriving in Vancouver. An American missionary has received an award for his decades of work ministering to the Revolutionary Armed Forces of Colombia, or the FARC, whose 50-year fight against the government had been the world’s longest continuous war when it ended in a peace agreement last August. Russell Stendal has been in Colombia for over half a century, having first arrived with his parents – also missionaries to the Indigenous people there; it was this which later helped him build relationships with the rebels. Stendal has been kidnapped by the FARC and by other rebel groups, but he launched his Bogota-based ministry, Colombia for Christ, with his captors in mind. His audacious vision: that all of the FARC can learn about Christianity and that, if embraced, it will change guerrillas’ hearts and minds. Stendal was presented with the award in Bogota January 22 by First Step Forum. The Shahbaz Bhatti Freedom Award is named after Pakistan’s first Christian Cabinet Minister, murdered almost five years ago for his criticism of Pakistan’s blasphemy laws and his defence of Asia Bibi, a Christian woman still on death row for “blasphemy”. In his speech, First Step Forum’s Finnish founder, Johan Candelin, said Stendal deserved the award for his “extraordinary peace work for 32 years,” saying that his work had led to a change of heart in many FARC leaders, and also in Colombian Army leaders: “Many have been healed as a result of prayer”, he said. Previous recipients of the award include Pope Francis, Burmese leader Aung San Suu Kyi, Dr. Hany Hanna in Egypt and Bishop Malkhaz Songulashvili in Georgia. The first time, in 1983, Stendal was held for five months with his hands tied to a tree with nylon. Eventually his captor – an Indigenous rebel commander – recognized him as the son of a man whose lifelong work had focused on helping indigenous groups in the country. That was enough for the guerrillas to release him – but not to prevent them from seizing him again. 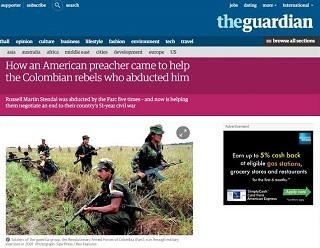 Given the number of times he was kidnapped, it might be natural for Stendal to nurse bitter and resentful [feelings] toward the FARC. Instead, he claims to be helping the Marxist guerrillas negotiate an end to the country’s 51-year civil war in peace talks being held in Havana. . . .
Stendal has not played a direct part in the peace talks, describing his role as that of a “spiritual guide” to the rebel group. That a self-proclaimed Marxist-Leninist revolutionary army would receive spiritual counsel of a Christian missionary from the United States might seem incongruous, but despite FARC’s doctrinaire public face, many of its members are in fact Catholic or evangelical Christians. . . . But his experiences in Colombia transcends the spiritual plane. Discussing the current negotiations between FARC and the government, he reveals sharp political insight about Colombia, the actors in the conflict and the way forward toward ending it. . . .
Colombian government negotiators say they doubt Stendal is playing any role in the talks, but sources within the FARC confirmed that he wields significant influence over senior rebel leaders. 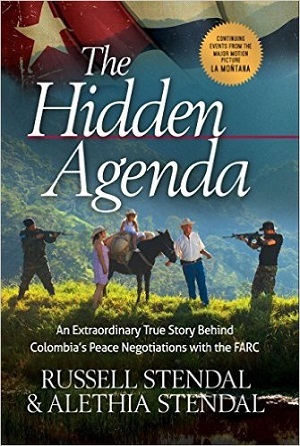 Stendal handed out copies of a book he wrote with his daughter Alethia in 2014: The Hidden Agenda: An Extraordinary True Story Behind Colombia’s Peace Negotiations with the FARC. We’ve been directing a peace campaign in Colombia for the last 35 years, trying to end the war, and we’ve spent the last four years accompanying the Colombian peace process, where the Colombian rebels and the Colombian government have been negotiating in Havana, Cuba. That has now come to a successful conclusion, and now we’re back in Colombia, as the government and the former rebels are implementing the peace accord. The rebels are turning in their weapons to the United Nations in special designated places and they are becoming a political party that has renounced violence and is anti-corruption. Many of those rebels have become Christians, people in the Colombian army, many of them have become Christians, and vast numbers of people in the rural areas of Colombia have become Christians in the midst of this conflict. Stendal, who comes to Missions Fest every year, said he began praying that his parents would go to work with the Indians in Colombia when he was just four years old. They went when he was eight; he has told his story in Rescue the Captors, Rescue the Captors 2 and The Hidden Agenda. ← Around Town: Connections Coffee House, A Reconciling Love, Beth Moore . . .